On June 23, 2016, people from the United Kingdom voted to exit from the European Union. By the time the smoke cleared, 17,410,742 people voted to Leave, while 16,141,241 people voted to Remain. Over a million more wanted to Leave. For some perspective on the history of EU and Brexit, here’s a video on YouTube. It’s kind of slow in pace, so you might want to set the speed at 1.5x. I was in the UK the week before the vote, and interestingly heard someone say the UK will go on recession if the UK leaves. That statement had me pondering for a week now. It is obviously a very complex issue with deep implications. Remember that Brexit is only a vote to leave the EU. It does not mean the UK automatically stopped being part of the EU. Changes this big requires paperwork, which is called “Article 50 of the Treaty on European Union. With Cameron’s resignation, it’s up to his successor to do that paperwork. The UK would negotiate treaties with the EU. Remember that a Treaty is simply a law made between countries. There’s talk that the EU will give the UK a hard time with the trade agreements. Keep in mind that trade goes both ways, and it could escalate into a trade war quickly. For example, if the EU puts a tariff on UK sports cars, the UK could impose tariffs on German luxury cars. The only losers in that example are the car companies. So it’s in the best interest of the UK and EU to thread carefully. Brexit alone is not what people should be worried about. Instead, they should worry about others who want to split off. Unfortunately for the UK, both Northern Ireland and Scotland voted to Remain. That brings uncertainty could lead the UK to have a smaller land area if those two decide to leave. Additionally, initial media coverage mentions other EU countries expressing interest in leaving the EU. With possible splits within the UK and within the EU, that adds up to a lot of chaos and uncertainty. Let us suppose you are from mainland China looking to buy a home in London, which you will stay in when you visit. That is very much common knowledge among UK residents, and are being blamed for skyrocketing home prices. Basically, assuming London home prices stay the same, the currency devaluation of the GBP translates to a 12.8% Off sale on London homes. This could result in upward pricing pressure (higher prices), because foreign money goes further so they can afford to buy at a higher price. However, with Brexit, the UK government now has the chance to impose restrictions on foreigners buying UK homes. So, how much the pricing pressure increases depends on how the UK government remedies this problem. Assuming they put a clamp on foreign buyers, Londoners may actually have a chance to buy affordable homes. Let’s extend the same example to the US housing market and assume that the same mainland China investor brings 1 Million CNY to the US with the intention of buying a home. That means after Brexit, US homes are now at a 1% Premium (more expensive) due to currency effects. Admittedly, that’s not much of an increase. That’s not surprising either. 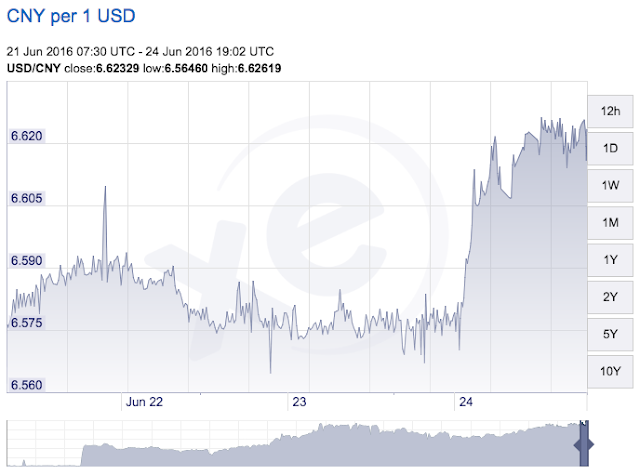 If you ask anyone who works with currency hedges for a multinational firm about China’s currency, they’ll say it’s exchange rate is very consistent. In fact, they are known currency manipulators, to make their goods favorable for export to other countires. What might happen is in the end, the 12.8% discount of the GBP will cause foreign investors to focus on London real estate. Plus, they have to act fast before the UK government clamps down on foreign buyers. The focus on London would then translate to less focus on buying US homes. With Brexit being a reality, the US Fed’s Janet Yellen probably won’t be announcing any rate hikes this year. Keeping the rates of overnight loans unchanged at these historically ultra-low rates will result in continued ultra-low mortgage rates, which is both good and bad. The good news is that low mortgage rates mean the same amount of money borrowed results in lower interest payments. However, that also means the barrier to entry for being a homeowner will continue to be low. More competition for the same home results in bidding wars. However, there’s a gloomier scenario… With globalization, it’s guaranteed that US multinational corporations will have UK and EU exposure. At a minimum, those corporations will take a big hit from UK and Euro currency devaluations. When a company files its quarterly SEC earnings reports, they will convert the profits from GBP or Euro back into US Dollar. 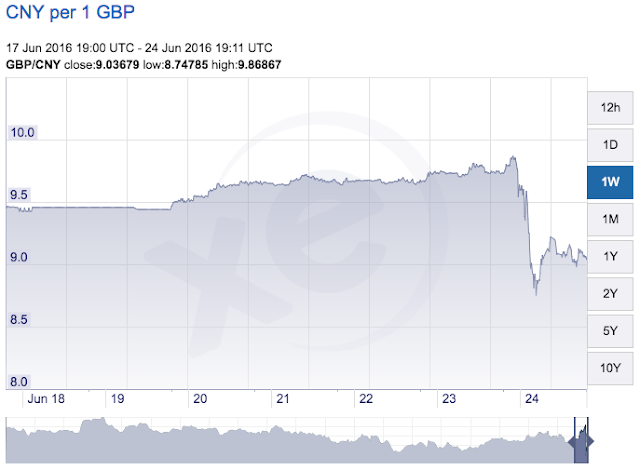 However, since the GBP went down a lot, it will result in less earnings in terms of USD. Less profit means execs get a smaller bonus, and to please brutal Wall Street, they start cutting costs either by reducing headcount, cutting corners, or investing less on big projects. That uncertainty could scare potential buyers in weak financial positions away from buying a home, which results in less competition, and consequently home prices face downward pricing pressure from decreased demand. This is what it would probably take to pop the housing bubble. Brexit will bring very deep change that could put the UK in better shape many years later. It is not instantly done and will have to follow a process. The chaos dragged their currency down to a 30-year low, which causes their goods to be at a 12% discount (on sale, 12% off, bargain!). That sale price for UK goods (including real estate) could prove more attractive to international buyers than for US real estate. The US Fed will likely keep interest rates low for the rest of the year. Unfortunately, with an easy money (cheap money) environment, home prices will rise. However, if Brexit brings enough shock waves and chaos into the US economy, fewer residents might dare to buy a home, which gives the US housing bubble a chance to deflate gracefully a little bit. The Next Housing Bubble Blog provides general information only. Its content should not be considered as investment advice. All site content, including advertisements, shall not be construed as a recommendation to buy or sell any security or financial instrument, or to participate in any particular trading or investment strategy. The ideas expressed on this site are solely the opinions of the author(s) who may or may not have a position in any company or advertiser referenced above. Any action that you take as a result of information, analysis, or advertisement on this site is ultimately your responsibility. Consult your investment adviser before making any investment decisions.